It’s been a long time coming, but the new album DO YA by The Screaming Jets was certainly worth the wait. Eight years on from the band’s last studio album ‘Scam’, DO YA is the epitome of the style of Oz rock the band has become known for. This is the Jets smashing back onto the music scene in true rockin’ fashion. Although they’ve been no strangers to the Australian public across the years, touring the breadth of the country to keep the love of Oz rock alive, the release of DO YA will make the listening public sit up and pay attention. The first single from the album, the title track DO YA, is certain to spark up the airwaves of radio and wake everyone the f**k up! 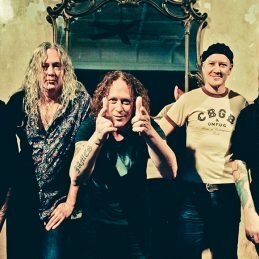 The key behind the record is that The Screaming Jets are back, they’re strong and they’re not going anywhere, unless it means on stage to rock the socks off the Australian public. Drummer Mickl Sayers says the album is different to previous Jets’ releases, but still with an underlying theme of rock. “This album says The Screaming Jets aren’t over yet,” he says. “The band still has a lot to give the industry, and of course, the fans that have been waiting patiently for a new album. The new songs have versatility and they cover a range of genres. Some songs are quite different for the band. We see the song DO YA as a ‘traditional’ Jets’ song, being that it is good Aussie rock and in your face, we hope it will grab people’s attention straight away.” Founding member and bassist Paul Woseen believes the future for the band is nothing but bright. “This album will show that we are back,” he says. “Actually, it will show that we’ve never left. We’ve got a great sounding band – the band is really vibing at the moment. We’re excited at the prospect of releasing and touring this new record. Of the recent live shows, the band’s playing really f**king well. I feel like the band is in a good place.” And he adds that whatever the future holds, it is certain that the band will keep striving, rockin’ and recording. Guitarist Izzy Osmanovic believes the album represents a finer angle to the band’s songwriting and shows a maturity which he thinks will see it highlighted as a trademark release for the Jets. “I think this album sounds quite fresh,” he says. “When we went to record this album, I remember saying to the boys, ‘lets do this album for us’, and it is a case of as long as it takes us. Lets not rush it and just turn it into another record, we need to do something a little bit different and take our time with it. Even if it takes a couple of years in the making when we walk out of the studio and we know that we’ve finished it, and we get goosebumps and we know that it is the best thing that we could possibly do.” And this thought process has run true with DO YA. From an engineer’s perspective, Scotty says there isn’t one weak moment on the album and the first single DO YA is a killer riff that grabs the listener by the collar and shakes the living s**t out of them until they react. “This record goes from four on the floor rock, to some more laid back richly textured classic rock moments, all of which are complimented by some incredible vocal performances from Dave which in turn bring out some magical performances from the rest of the band,” he says. “Aggressive, mature, intelligent, well crafted songs from a band that have really done it all but are still really hungry to grow, experiment and develop. It sounds big but slick just how I envisaged it to be.” The album was also mixed in the States by reputable multi-award winning producer Stevie Salas (Daughtry, Jordin Sparks, Mick Jagger) and Grammy nominated Juno award winning engineer Brandon Frieson. Even Grammy nominated MTV award winner Matt Sorum (Guns ‘n’ Roses, The Cult, Velvet Revolver) played guest percussion on the record. All such involvement is certain proof that this is one special record.